SOLD! Original Julius H. Marling Mid-Century Split Level in Northbrook! 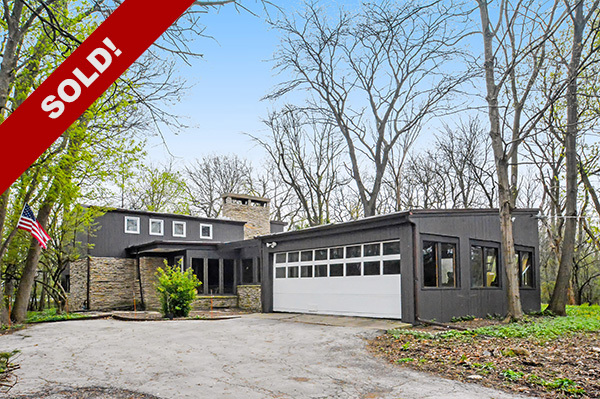 Wonderful Mid-Century Modern split level home designed by Julius H. Marling on 1 1/3 acre in the exceptional New Trier H.S. district! Enjoy the views of nature through the many large, floor-to-ceiling windows. Spacious living room has wood floors and beautiful vaulted wood ceiling with original recessed lighting and gorgeous stone fireplace. Separate, open dining area between the living room and kitchen continues the lovely views. Main floor also includes powder room and access to the 2-car attached garage. Walkout level with floor-to-ceiling windows, its own stone fireplace, full bathroom and laundry. Enjoy the original MCM details as you head upstairs to two generously-sized bedrooms and another full bath. This home is in mostly original condition and needs updating & some repairs, but will be a fantastic home for the lover of mid-century modern architecture! Lower level could be converted into a large Master Suite. Estate sale, sold as-is. Existing home is not in the flood plain!